News reaches me of another hefty price cut, this time from HMY Yacht Sales as they send word of a $2 million reduction on the 49.3m motor yacht Remember When. She was delivered by Christensen in April 2010 and offers every modern convenience including zero speed stabilisers and a four deck elevator. Built to ABS class and MCA compliant, this superyacht’s contemporary interior by Carol Williamson & Associates accommodates 12 guests in six staterooms plus 11 crew in five cabins. Remember When has a cruising speed of 14 knots and a range of approximately 4,300 nautical miles. Lying in South Florida, Remember When is now down to $33.9 million. 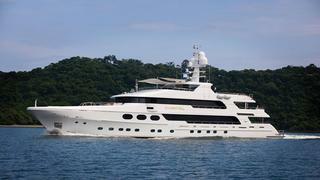 The boat will be on display at the forthcoming Palm Beach Boat Show.